From there, she completed a postdoctoral specialized small animal internship and now has specialized training in the following fields: internal medicine, surgery, oncology, neurology, ultrasound and emergency medicine. 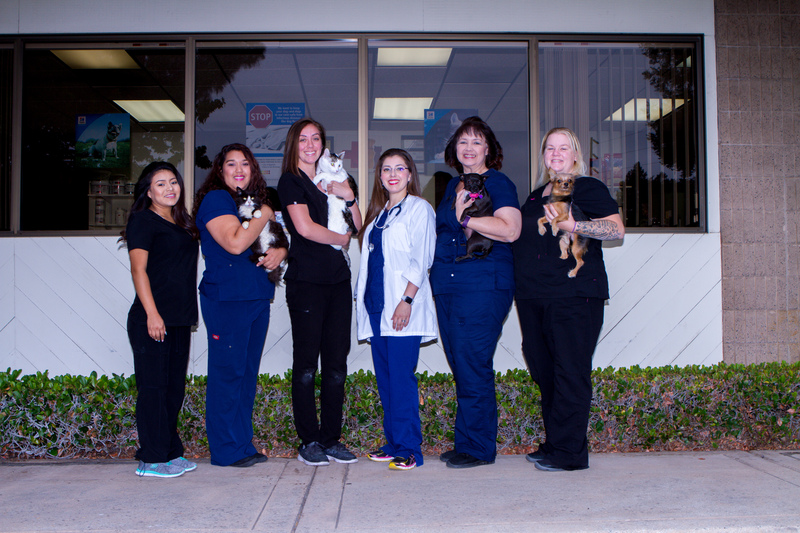 Jennifer joined Alpine Animal Hospital in November 2017. She graduated from Carrington College, where she received her Associate's Degree in Veterinary Technology. In the veterinary field, she has a special interest in performing dental prophylactics and assisting in surgeries. Jennifer is working on obtaining her RVT license and in the future plans to specialize in either Dentistry or Surgery. She grew up loving animals and now has her cat Priscilla, and a Budgie named Sky. In her free time, she enjoys spending quality time with her precious pets and visits local shelters in her area. My name is Mirella Lopez, I graduated from Woodside High School in 2009. I am a pet mom of four pets, three dogs and one cat. Bella is a seven year old pit bull that enjoys moon walks. Kenzo is a seven month old French bulldog that enjoys playing with kids. I also have Love, a ten year old chihuahua that does not like anyone except her mom. Last, Sky is a two year old Russian blue that enjoys going outside. My goal is to go to Veterinarian School, so I can continue working with pets. Corina Aristeo is a receptionist at Alpine Animal Hospital since March 2018. She has 5 years of experience working in customer service and has won awards for her dedication to others. Corina understands the importance of making the customer feel welcome and enjoys helping others. She likes to have good quality time with her family; her being the older sister has given her more responsibility about looking out for her brothers, which have helped her in this field to always be alert for all our patients and making sure they get the proper care they need. Hello, My name is Daisy. I’m 15 years old and the one and only hospital cat. I love it here at Alpine. They play with me and give me outside sun time. Things I can’t live without = A comfy fluffy clean bed and food! I love any kitty food and love to eat 24-7. I have gained about three whole pounds. And love it! Grooming is my favorite pass time…Especially under the sun.